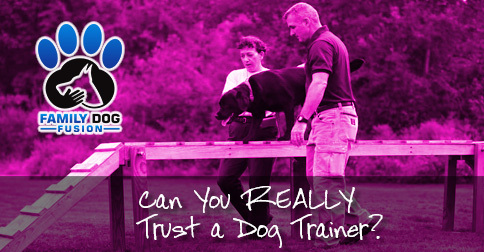 Can You Really Trust a Dog Trainer? Hiring a dog trainer is one way to train your dog. The other way is to do it yourself. Although there are benefits to both avenues, what you choose really depends on your purpose for buying the dog. Is your dog going to work for you or be a part of the family? This is the only question that you need to answer before you can make the decision as to how to train your dog. Yes, there are many people that have a dog that both lives with them AND has a job. In this case, the dog still needs to understand the importance of boundaries in that home. If you answered that your dog is going to be a part of the family, then the only choice, in my opinion, is to have someone teach you to train your dog. This is the ‘do it yourself’ option. I say having a professional trainer (or behaviorist) come to you is the best option for many reasons. How you choose a personal trainer is also important. The process through which you choose a personal trainer should be no different than choosing anyone you may use for a professional service. How would you go through the process of finding a babysitter or daycare for your child? What would you do if you needed someone to clean your home or house sit? Would you just jump on Craigslist and pick the first available? No. When you are choosing someone to teach you how to train your dog, it should be someone you can work with and learn to trust. Everyone is different when it comes to how we view our dogs as part of the family. A trainer should be flexible, patient, and most of all, intuitive to the needs and abilities of your family. Some of the benefits of having a trainer and learning to do the training yourself are: Attention to personal needs and preferences; A better and longer lasting bond; The pace of training is appropriate; and Questions are answered as they arise.